Tecno Boom J8 is here to shake the African markets. 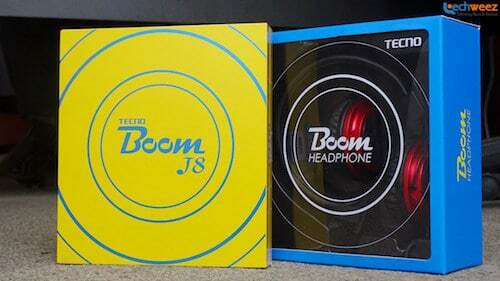 Shipped with a fanciful Boom headset, the Tecno Boom J8 is built to give a lasting experience for all music lovers across the globe. The new phablet is the predecessor to theTecno Boom J5 and J7 and it promises a great multimedia experience. The Tecno Boom J8 sports an aesthetically pleasing plastic body with a metallic frame. The ease and flexibility in handling the device are uncommon in most 5.5 inch smartphones. TECNO put all three control buttons on the right-hand side of the Boom J8. The 3.5mm earphone jack is at the top, while the micro-USB port and speaker are at the bottom. Its pixel density of about 267 ppi is just okay to ensure an enjoyable viewing experience. The phablet is powered by a 64-bit Quad-core 1.3 GHz Cortex-A53 Mediatek MT6753 Processor on a Mali-T720 GPU. And it is equipped with a 2 GB of RAM – to give you a smooth multitasking. For storage, the phablet offers integrated capacity of 16 GB, which is expandable up to 128 GB using a microSD card. That is pretty cool. It also features a 13MP camera at the back which possesses Auto Focus and LED flash. At the front is a 5Mp camera. The smartphone is accompanied by a 3000mAh non-removable Li-Ion battery with support for fast charging and ultra power-saving mode. On standby mood, the BOOM J8 can give you as much as seven (7) days of sleep mode. Tecno Boom J8 is the first Tecno device to come with HiOS, Tecno’s own customized version of Android OS. The HiOS brings fluidity and speed to TECNO BOOM J8. As would be expected, the device also features dual SIM card slots and offers 3G connectivity with download speeds of up to 18 Mbps. The price of Tecno Boom J8 in Nigeria ranges from N30, 000 to N45, 000 depending on where and when you purchase the smartphone. You can purchase the smartphone from leading online stores in Nigeria. Follow the links below to get the best deals.